Why Did Lou Gehrig Hit Better On The Road Than At Home? To see his career splits at Retrosheet, click here. For his career, his home AVG-OBP-SLG were .329, .435, .620. On the road they were .351, .457, .644. There is at least a 20 point difference for each stat. This seems strange since players usually hit better at home. Fack Youk looked at this issue a bit in 2009. 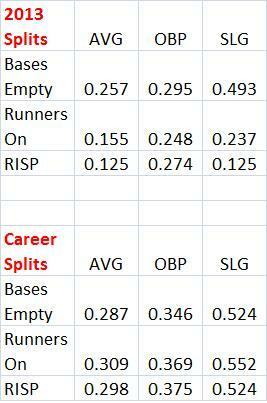 See Jeter, Gehrig, And Home/Road Splits. It does not seem like they got into too much detail, perhaps because of data limitations that may no longer be a problem. 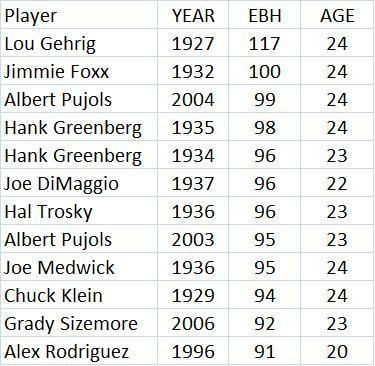 The table below shows how Gehrig and the AL did from 1925-1938 (so not quite all of his career). H means home games and A means away games. 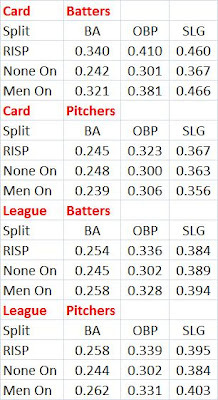 Some data was from Retrosheet and some from Baseball Reference. 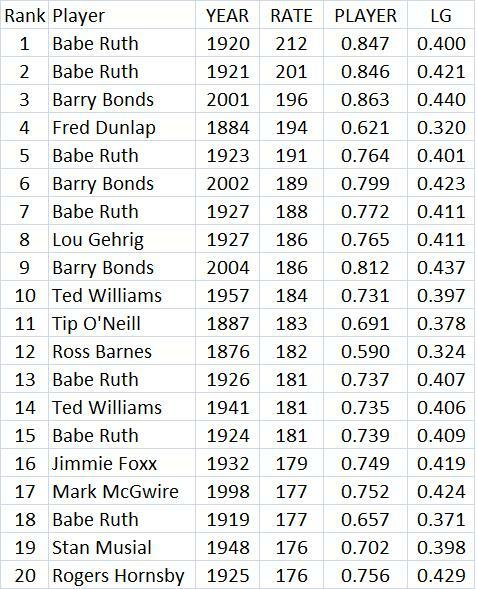 It is pretty clear that AL batters from 1925-38 hit better at home. 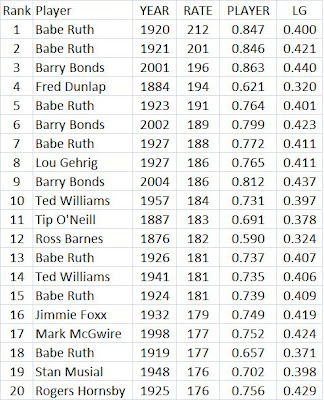 Their AVG was 14 points higher at home while Gehrig's was 22 lower. So that is a swing of 36 points. The swing for SLG was 47 points. It is pretty clear that those other Yankee lefties did better at home (except in batting average on balls in play (BABIP)). But even there Gehrig had a bigger difference, .033 vs. .012. This just about explains his lower AVG, SLG, OBP at home. Notice his ISO (SLG - AVG) is just about the same, home and away. 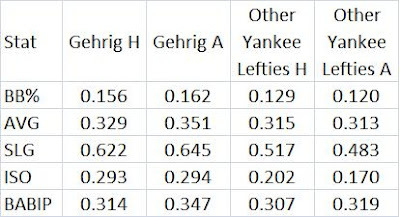 The other Yankee lefties did much better in ISO at home. Maybe Gehrig was more of a line drive hitter, so he did not get as many HRs into the short rightfield porch as we might have expected. That would also explain why he got hurt even more on BABIP. If the right fielder is playing in closer, he catches more of those line drives and your BABIP suffers. 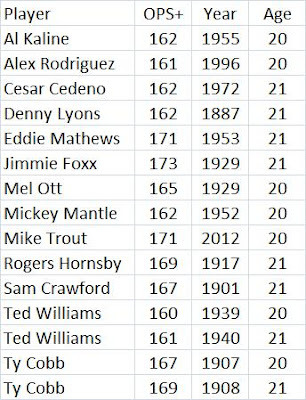 Here are the top 10 Yankee lefties in PAs from 1925-1938 not counting Gehrig (I also removed Lefty Gomez, since he was a pitcher). These guys collectively had about 12,900 PAs at home and about 14,000 PAs in away games. Have The Cardinals Been Lucky So Far This Year? Maybe a little. I started wondering about this when I saw that their AVG with runners in scoring position was .340 while it was .242 with none on (also, it is .321 with runners on). 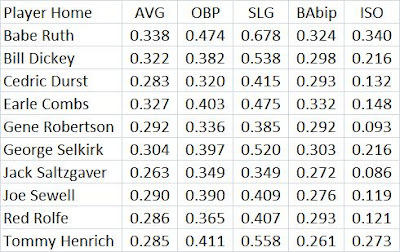 Averages are usually a bit better with RISP and runners on, but those are huge differentials. The table below shows how the Cards and the league have done in various situations. 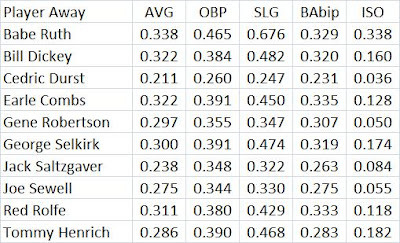 If you look at the pitching numbers carefully, you can see Cards pitchers are doing a bit better than the league average as well. To estimate how many wins the "luck" has given the Cards, I used my equation for generating winning pct based on OPS differential. The Cards batters have an OPS of .747 while their pitchers have allowed a .663 OPS. So their differential is .084. That should give them a pct of .602 while in reality it is .644. That gives them an extra 3.08 wins. But they would still have a very good record without the luck. 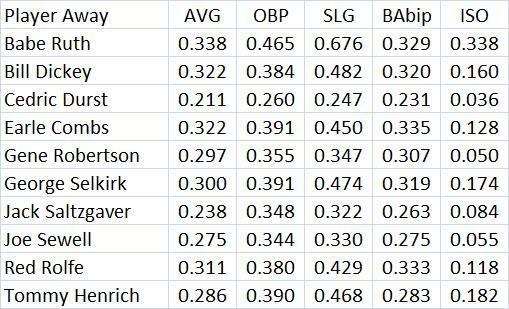 The Cards have a 0.337 OBP this year and a 0.410 SLG. The formula predicts they would score 4.64 runs per game while it is actually 5. So that is about .36 runs extra per game, probably due to their great hitting with RISP and runners on. 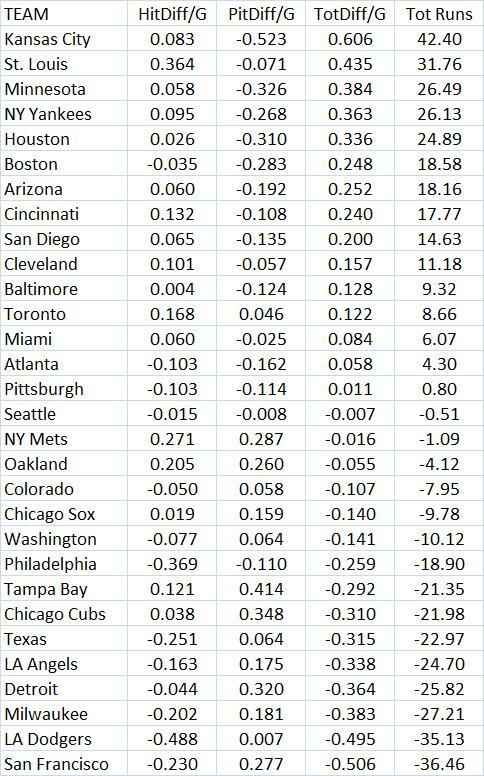 The only team over the years 2010-12 to have a greater positive differential than the Cards this year were the 2010 Rays, who had .45. The next best team this year in all of MLB is the Mets, at .29. The Card pitchers have allowed a .302 OBP this year and a .360 SLG. 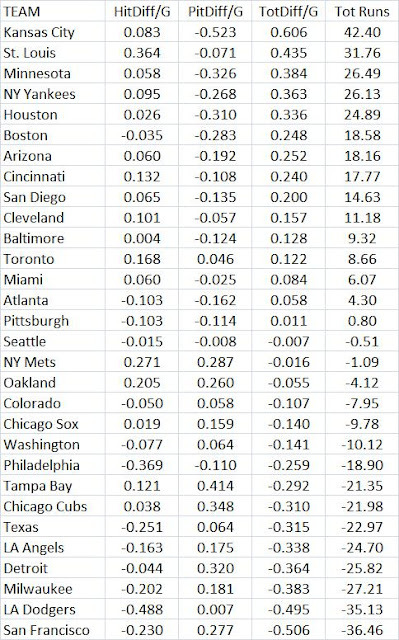 The formula says they should allow 3.55 runs per game while it is actually 3.479, for a difference of 0.071 runs per game. 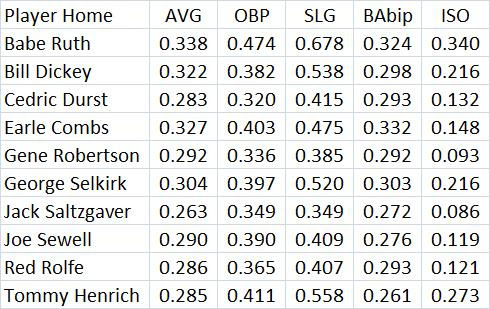 So combining the .36 runs from batting with the .071 fewer runs allowed, we get .435 total extra runs per game (there is some rounding going on). Over 73 games, that is an extra 31.76 runs. But they are only the 2nd luckiest team so far this year. The table below shows how all the teams have done. Trout has a 161 OPS+ so far this year and last year he had 171. So he could have 2 seasons of 160 or higher through the age of 21 (he won't turn 21 until after June 30). 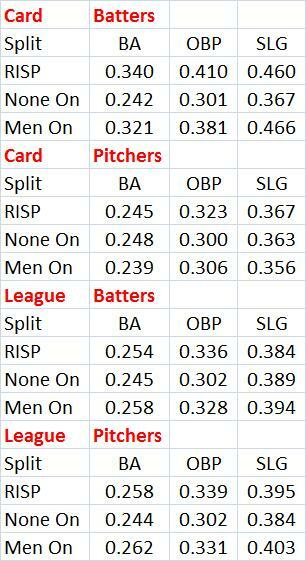 Below are all the seasons of OPS+ of at least 160 through the age of 21, with at least 400 plate appearances. Both Cobb and Williams did it twice. Trout could join them this year. Even having one season like this puts you in very impressive company. They generally had long, productive, if not Hall of Fame, careers. What if I lower the standard to a 150 OPS+? 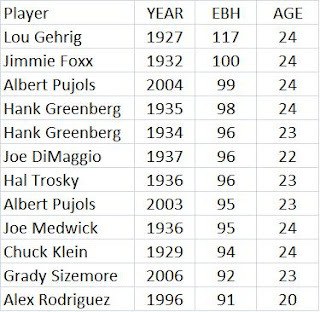 Here are all the players to have 2 seasons of at least a 150 OPS+ through the age of 21. Again, a very outstanding group of players. He has 23 extra-base hits this year and only 20 RBIs. As I show later, he his hitting terribly with runners on base this year while in his career he has generally been pretty good. He is on a pace to get 57 XBHs this year. Below is a list of all the players in the last 10 years to get 50+ XBHs yet have more XBHs than RBI. They tend to look like guys who bat 1-2 while Hamilton has been batting mostly 4-5 this year with 23 ABs batting 2. I think Sizemore in 2006 was the only player ever to get 90+ XBHs in a season yet have more of those than RBI. He batted mostly leadoff. I think the record positive difference is Frank Baumholtz in 1953. He had 46 XBHs and 25 RBI. He was pretty much a 1-2 man. Here are Hamilton's splits for this year and his career. I got this from the Lee Sinins Complete Baseball Encyclopedia. The age column shows their age as of June 30. So if a guy turned 25 on July 1, his age for that season is listed at 24. But all of these guys turned 25 after the season in question. 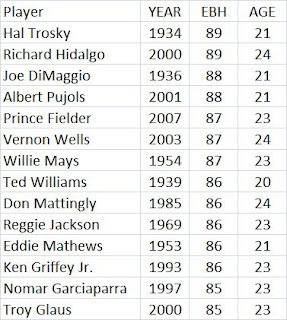 They are all pretty much Hall of Famers or guys who put up Hall of Fame type numbers, except for Sizemore and Trosky. But even Trosky was very good. Through age 27, he is 124th in career WAR among position players. If he had finished with that rank for his whole career, he would be a borderline case. He only played 312 games after the age of 27. His SABR bio says he suffered from very bad headaches starting around that time. He also finished in the top 7 in OPS+ 4 times. Sizemore had 53 2Bs, 11 2Bs, 28 HRs. Through age 25, he was 48th in career WAR among position players. He had 4 straight years in the top 10 including a number 1. Maybe he was headed for a Hall of Fame career before injuries. 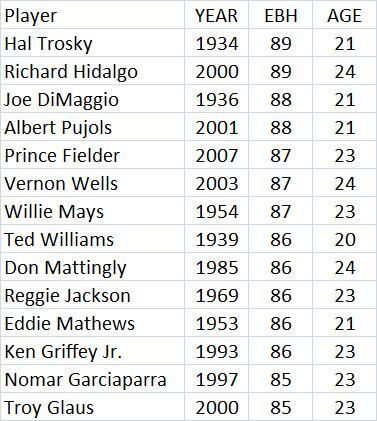 And here all the guys that had from 85-89 under age 25 (I did not check to see if they turned 25 in the season in question so a few of them might have made the cutoff after their 25th birthday). It is also a pretty impressive list. That goes back to last year, including Sept and Oct. He has 30 HRs in that stretch. His SLG this year is .754. That is about 83% higher than the league average, which is .413. If he kept that up for the whole season, it will be one of the greatest relative SLGs ever, at 183. Here are the top 20. Chris Davis' Absurd Season by Matt Hunter of "Beyond the Boxscore"